Padmasambhava incense is entirely handmade and amongst its many ingredients are sandalwood, medicinal herbs and precious stones such as turquoise, coral and gold. This incense is specially offered to Guru Padmasambhava during prayers when we request him to fulfill our wishes. This incense also helps to protect us from negative energies. 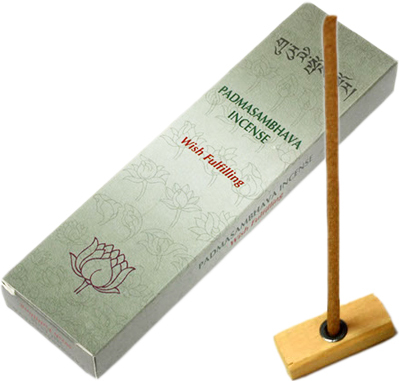 Padmasambhava Incense uses no bamboo core, contains natural ingredients, is non-toxic and hand rolled in accordance with traditional Tibetan methods.